HARARE, Oct 11 2013 (IPS) - Admire Gumbo, 26, from Harare’s Mabvuku high density-suburb, is loathe to leave Zimbabwe to return to Botswana. However, he feels he has no choice but to return to the neighbouring country where he worked for three years as a manual labourer. “I’m a qualified electrician with a national diploma. Previously when I stayed in Botswana I never had a decent job, but thrived on casual jobs usually as an assistant builder in the construction industry where I earned 60 Pula [about seven dollars] a day. Now going back there is a difficult decision I have made because I can’t get a job here,” Gumbo told IPS. Just over two months after the controversial polls here saw President Robert Mugabe win another term of office, Zimbabweans, convinced that there will be no change of rule here, are leaving the country in large numbers. 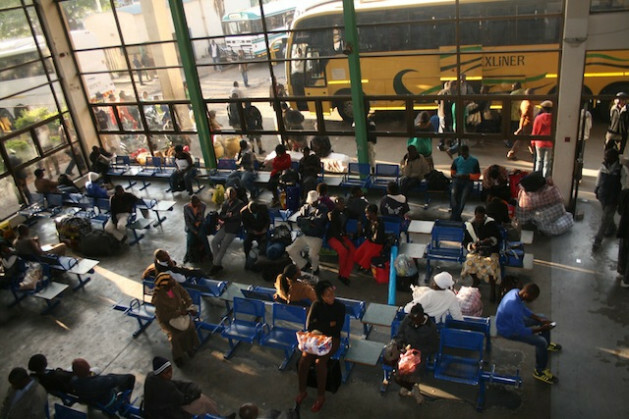 Edwin Gandari, chairperson of the Zimbabwe Cross Borders Transporters’ Association, an association that transports undocumented emigrants, told IPS that business has peaked after the Jul. 31 elections in this southern African nation. “We were not sure about our business soon after the polls here until more than a month later when people travelling to seek better opportunities in neighbouring countries began seeking our services in their numbers,” he said. “On average, our association now records about 1,200 undocumented migrants a day crossing over to neighbouring countries like South Africa, Mozambique and Botswana after the polls,” added Gandari. A border official at the South African-Zimbabwe border said the number of Zimbabweans crossing into South Africa had almost doubled. “Our government commended the election outcome in Zimbabwe, but surprisingly more than two months after those polls we are now recording over 700 Zimbabweans daily passing through the border into South Africa,” the South African official told IPS on the condition of anonymity. According to the official, before this year’s elections approximately 400 Zimbabweans crossed into South Africa daily. It is estimated that more than three million of Zimbabwe’s 12 million people left the country after 2000, during the peak of Zimbabwe’s economic meltdown. Between 2003 and 2009, the country had one of the worst rates of hyperinflation in the world and its year on year inflation was reported as 231 percent. The number of refugees fleeing Zimbabwe was so high that in 2009, South Africa’s Department of Home Affairs declared a moratorium on deporting undocumented Zimbabwean refugees and allowed them to stay in South Africa officially by granting them work and study permits. Many Zimbabweans like 31-year-old Jason Mandundu who returned home from neighbouring South Africa earlier this year hoped that this provision would no longer be necessary and that a new political dispensation would mean he could return home permanently. “We hoped for a new Zimbabwe under a new government not led by Mugabe. But now he stole his way back to State House and we see no economic hope under his leadership. Surely for people like me, there is no hope except to scrounge for a living in South Africa,” Mandundu told IPS. “People are leaving because Zimbabwe has proven to be unable to offer alternative means of survival to the unemployed,” Okey Machisa, director of the Zimbabwe Human Rights Association told IPS. Economists agree that Zimbabweans’ renewed exodus to neighbouring countries is because of the unchanging economic climate here. The country’s economic meltdown has been blamed on Mugabe’s policies, which include a controversial land reform programme that began in 2000 and saw over 300,000 people forcefully occupy land previously owned by an estimated 4,000 white commercial farmers. Prior to this, agriculture provided employment for 60 to 70 percent of the population and contributed 15 to 19 percent to the country’s annual GDP. “Nothing notable is really changing here; rather life is becoming tougher and more expensive by the day since [Zimbabwe African National Union-Patriotic Front] Zanu-PF controversially roped to victory in the last elections. Zimbabweans who had begun to trickle back home are now heading to neighbouring countries,” independent economist Kingston Nyakurukwa told IPS. John Robertson, director of Robertson Economic Information Services, told IPS that Zimbabweans were emigrating to neighbouring countries largely thanks to the ruling Zanu-PF’s disrespect for property rights. “The realisation that no new job creation can be waiting for them here impelled those waiting for change to look for opportunities beyond our borders. They also see the damaging effects of the Zanu-PF government’s disrespect for property rights,” Robertson told IPS. Under the Indigenisation and Economic Empowerment Act of 2007, foreign-owned companies are required to sell a 51 percent stake to locals to stimulate economic growth. In an earlier interview with IPS Robertson had said this policy had scared away investors and led to several companies closing down after being taken over by locals.